We are frequently advised to seek help from the Gates Foundation. We don’t. Here is why. Castles, field systems, cemeteries and irrigation don’t sound like the things you would find in a desert, yet archaeologists exploring the ruins of the Garamantes civilization estimate that it was in existence as recently as 5 to 500 A.D. In one of the most inhospitable parts of the Sahara, there were farms as recently as Roman times! If, as is commonly posited by those who haven’t thought about it much, the Sahara is a desert due to purely ‘natural’ reasons, then there may be nothing we can do about it. But evidence abounds that human activity (primarily unintelligent farming methods) was the real cause, and this discovery adds support to that view. More at fox news, where they predictably used it to slag off Gadhafi. Posted in Desertification, Reforestation, Uncategorized, WaterLeave a Comment on Trees Make Rain III – evaporation. If this is true then it is yet another way in which forests create rain. A forest has a far greater plant surface area than farmland or desert. Posted in Desertification, Reforestation, Uncategorized, WaterLeave a Comment on Trees Make Rain II – Bioprecipitation. 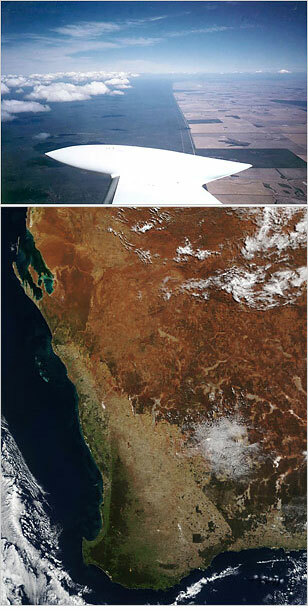 The image shows two views of the rabbit-proof fence, stretching aobut 2,000 miles across South-Western Australia. It separates off native land from farmland with the idea of keeping rabbits out. Clouds form a lot more on the native side than the other, showing a correlation between farmland and decreased rainfall. That’s it really, but there are some speculations and other stuff in a NY Times article about it. (And the fence, it doesn’t work, obviously — what kind of idiot would try to build a 2,000 mile long version of something they haven’t invented a one mile version of yet? And more to the point, what kind of idiot would pay them to do it? Oh, hang on, the kind of idiot that would chop all the trees down and expect to just keep on farming without them forever. The fence builders saw them coming didn’t they?! Posted in Desertification, Reforestation, Uncategorized, WaterLeave a Comment on Trees Make Rain I – Photographic Evidence.